Whether you are a professional racer or a weekend warrior, CP Carrillo has a piston for you. At CP Carrillo our pistons are tested to ensure that you receive the best available for your BMW S38 motor. Want to get the absolute best performance from your BMW "Big Six"? Do it best with our CP S38 Forged Piston Kit. These are the same premium pistons we use in our winning race and high performance street engines around the world! 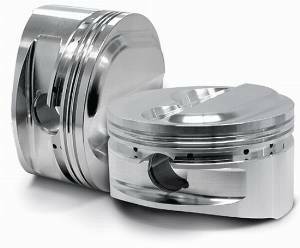 We feel that these are the best pistons for your high performance or racing engine, period. Working closely with CP, these pistons meet our most stringent expectations and are the finest available anywhere. We stock a variety of compression ratios and can also supply you with custom piston applications and parts quickly. Supplied with quality ring set, lightweight pins, and locks. Please make a note in your order if you would like this service. Keep VAC in mind: we are a full engine and machine shop and specialize in building the worlds finest BMW high performance engines. Call or e-mail us with your BMW needs. If your are building for high boost turbo applications, we recomend adding the CP heavy duty wrist pins, they are the prefered choice when making over 700HP. Consider our S38 turbo build kit for the best results and reliability.